Never Fall Down by Patricia McCormick blew me away. This is one of the best books I have read this year. It was such an emotional and tear-jerking read. I had a constant lump in my throat. It was not just the story, but the unique and authentic way it was written as well as the vivid, memorable and graphic images evoked on every page. 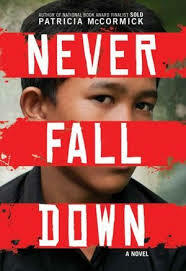 Never Fall Down is a mix of fiction with non-fiction centred on a real character, eleven year old Arn, who is caught up in a war he doesn’t understand and must do anything to survive. When Khmer Rouge soldiers arrive in his hometown, Arn’s peaceful and happy life is thrown into sudden turmoil. Forced to march far from their home, they are made to work the fields all day and listen to political speeches about the ‘Angka’ at night. Things get even worse when the men are separated from the women and the boys from the girls; Arn’s whole family is torn apart. Thinking of only surviving and reuniting with his family, Arn does whatever it takes to survive. However, in a world with no rules, where even the Khmer Rouge leader can be deposed of in a moment and replaced and where Arn is not sure of whom he is anymore and struggling to remember the reasons he is trying to survive, life is very fragile. I loved Arn. He is such a real character, I felt like I knew him. What I loved about him most was how honest he was about everything. As he was narrating the story, it felt like he was telling me all his secrets. Even the ones that made him look bad. He didn’t cover up any of the grim realities and horrors of the war; didn’t soften any blow. Never Fall Down is gritty, complex and a reflection of the darker side of humanity. Some of the goriness might be too much for some readers, but I loved it. Even though I’d never heard of this war before reading Never Fall Down, it was a great introduction.Also, I liked that Never Fall Down wasn’t written in Standard English but reflected how Arn would actually have spoken. All the characters were fantastic. I can’t think of one that wasn’t great and one who didn’t add something to the story. I particularly loved Sombo; his friendship with Arn was so complex and interesting. All in all, Never Fall Down was amazing from beginning to end and I whipped throughit. I loved reading up on Arn and finding out more about him. I look forward to reading more from Patricia McCormick. So glad you enjoyed this one, Kulsuma! It sounds fantastic. I really 'enjoyed' this one too. And it's a great introduction to a part of 20th century history that tends not to get covered in schools. This sounds like such a good book and I really love it when a novel can teach you something about history. I'll be looking out for this, thanks for the review!